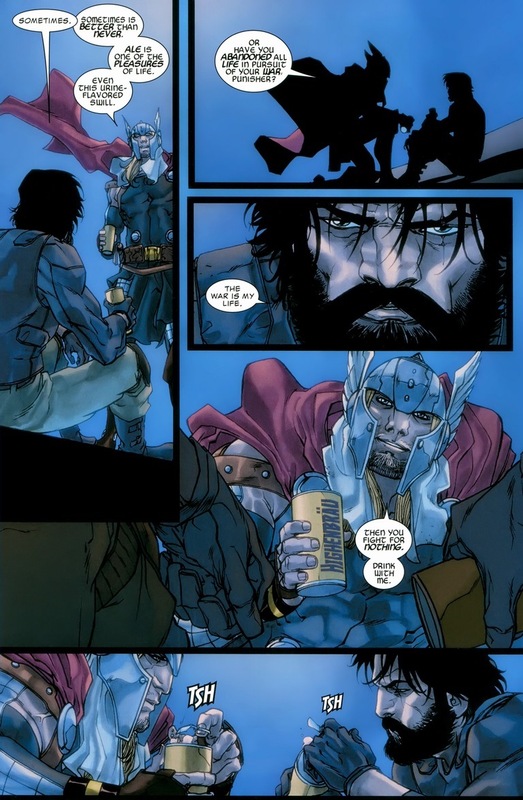 For a man like Punisher who’s so grounded in human limits and reality (to a certain extent), he’s more similiar to Thor — a Scandinavian thunder god who can fly and shoot lightning — than we think. 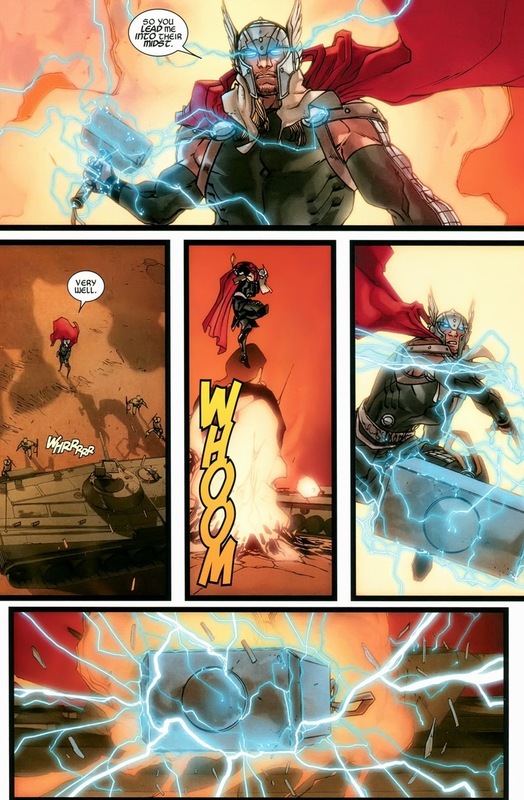 Thor’s hammer isn’t for carpentry, after all. Ever since Punisher’s teenage years and when Thor was an adorable godling, these two have been entrenched in the soldier lifestyle. Hell, I bet Thor’s killed more people than Punisher could dream of. But today, they have to fight, as (are you sitting down for this?) the Punisher is currently on the run from the law. Time for Avengers to take care of this matter, hence our upcoming conflict from Punisher: War Zone #3, written by Greg Rucka and drawn by Carmine Di Giandomenico. 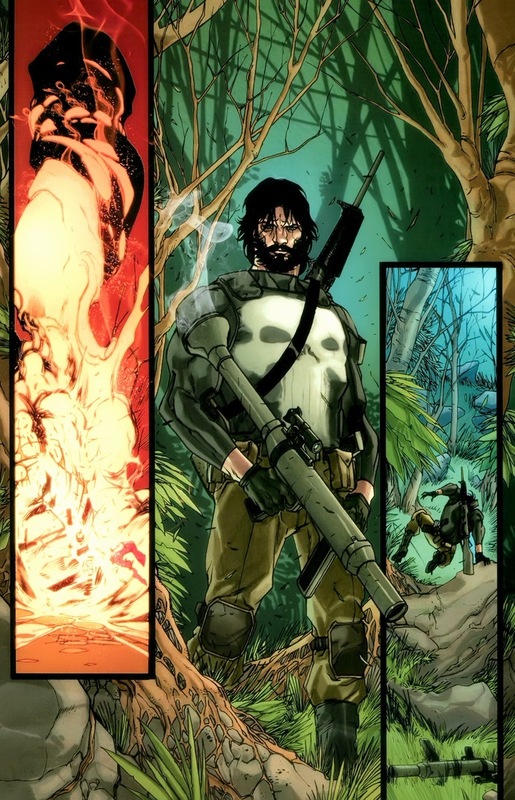 Frank Castle currently hides in Nicaragua, and by hides I mean wrecking havoc on every weapons trader he comes across. For a man wanted by every enforcement agency in the known world, he leaves quite a mess everywhere he travels. So, after the Punisher bested Spider-Man and Black Widow, a more powerful force needs to be called in. All that’s left is for Thor to find his prey. We can be honest here, right? The Punisher doesn’t stand a chance against Thor. Not a freakin’ chance. 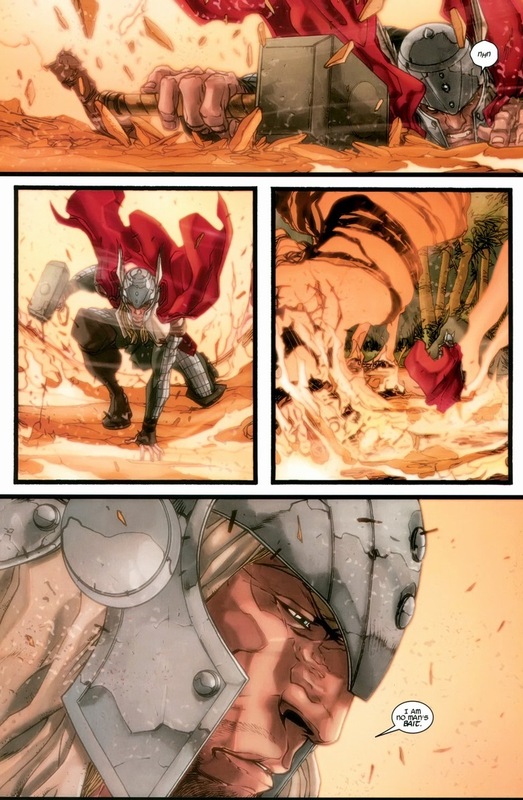 No weapon or device in his arsenal can even scratch Thor, much less take down the strongest Avenger. 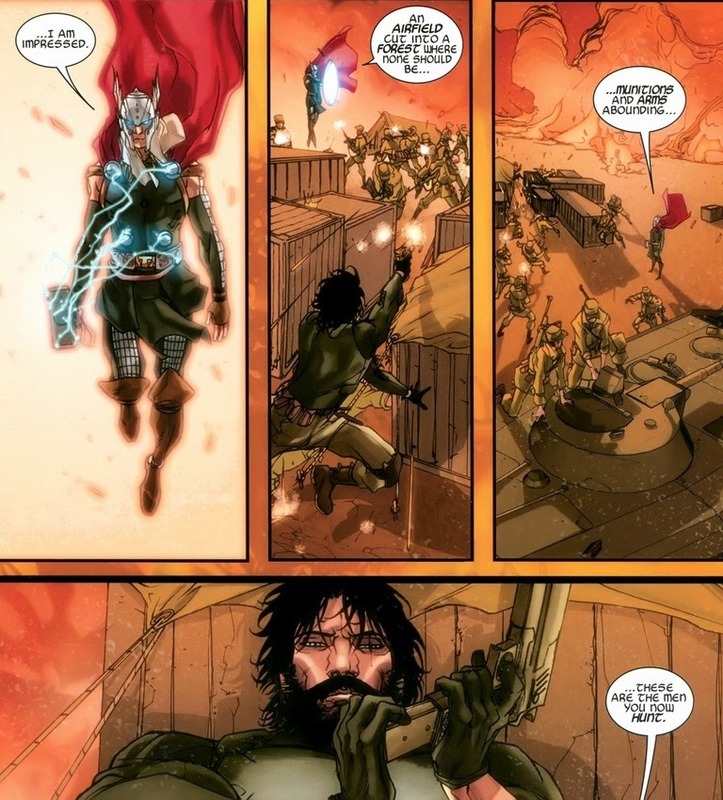 Seriously: Castle could shoot with him with every bullet, rocket, grenade, mine, and whatever alien guns he’s using — it wouldn’t even make Thor bleed. 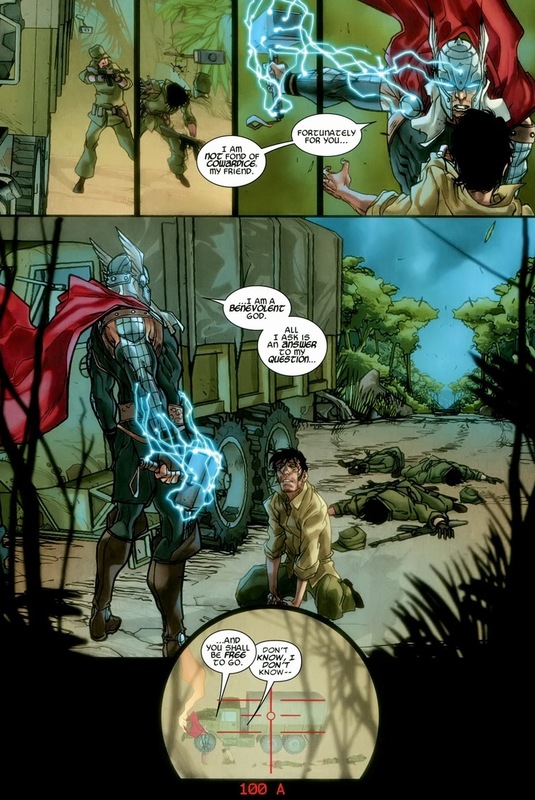 So being the smart soldier, knowing his time with Thor holds only one conclusion, he’ll have to use the thunder god for something useful instead. After all, Thor’s better against these weapon traders than every bullet, rocket, grenade, mine, and alien gun the Punisher possesses. You remember that scene from Avenging Spider-Man #4 where Hawkeye explains to Spider-Man that he can never, ever miss an arrow shot, because on a team with gods, wizards, Iron Men, super soldiers, and more, a single missed shot would only make him a normal man instead of a superhero capable of competing on the same level as his other teammates? It’s relevant. Punisher most likely spent weeks tracking these men down, finding their weaknesses, engaging in long firefights, watching out for flanking, etc. 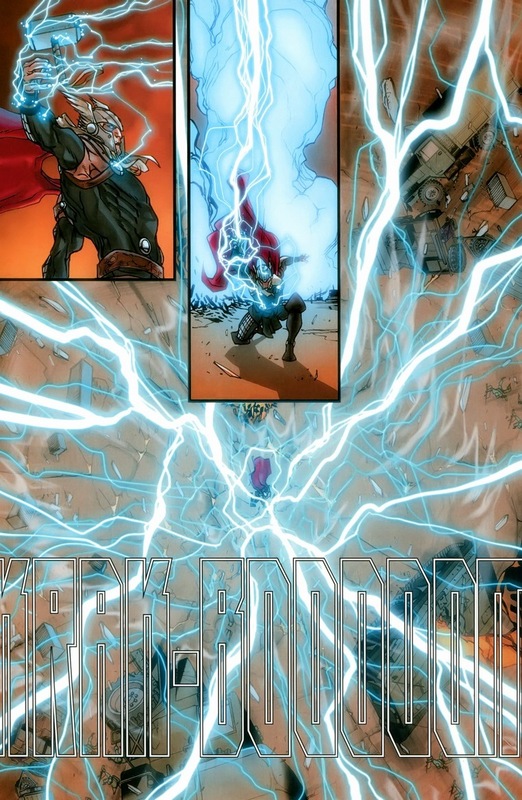 — and Thor takes down the whole camp in seconds with a single lightning strike. Damn right Hawkeye never misses. Now comes the philosophy part of our battle. I guess the “vs.” in the title is misleading, huh? No more punches get thrown, but we do get a very revealing moment as we all realize that of course Thor understands everything about Punisher’s mission. 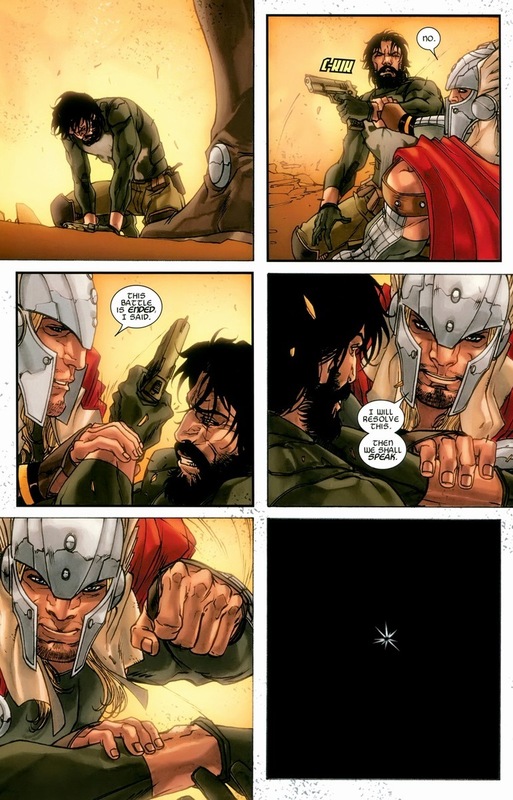 Captain America understands the horrors of war, and Wolverine understands the necessity of killing, but Thor gets why he fights. 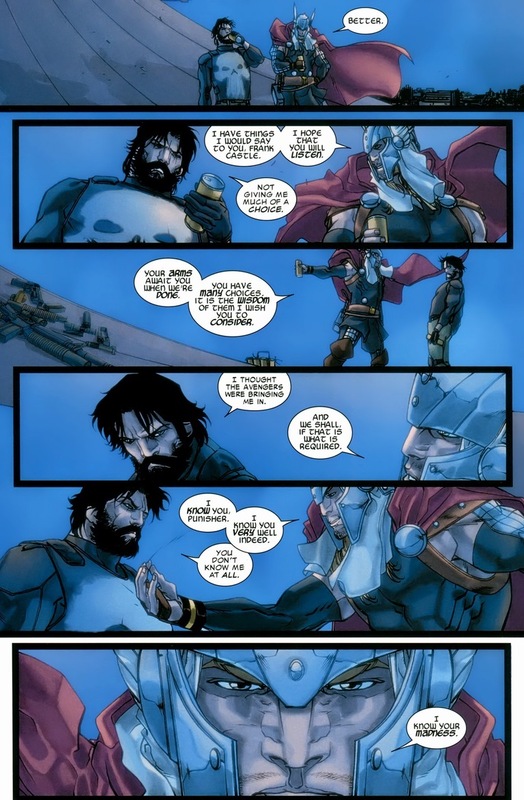 While our thunder god may not be on the same intelligence level as Tony Stark, he has a wisdom gained in his thousands of years that the others occasionally lack. I’ve made it my personal mission in my own life to never take advice from anyone wearing a cape, but Castle will just have to obey. It’s not like he can run away. And that al-Qaeda beard of his won’t let him book any escape flights anyway. 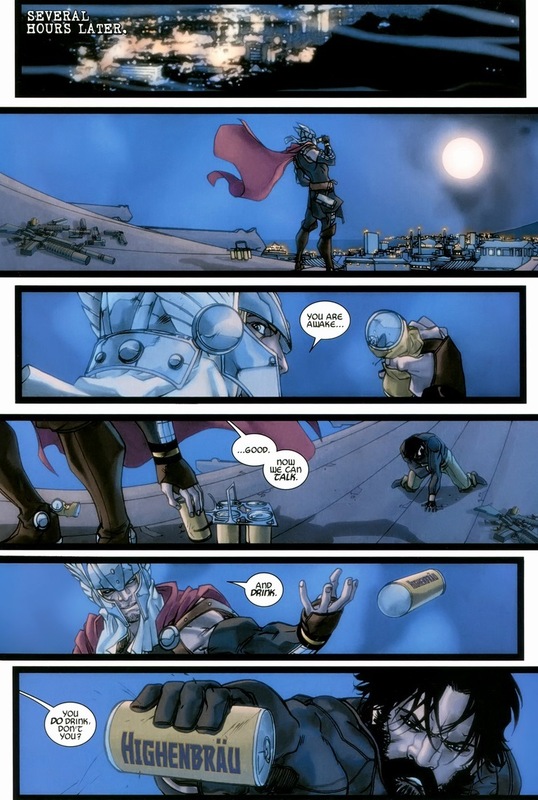 Let Thor rant about war for a while, because it’s most likely the topic he knows the most about anyway. That or mead. 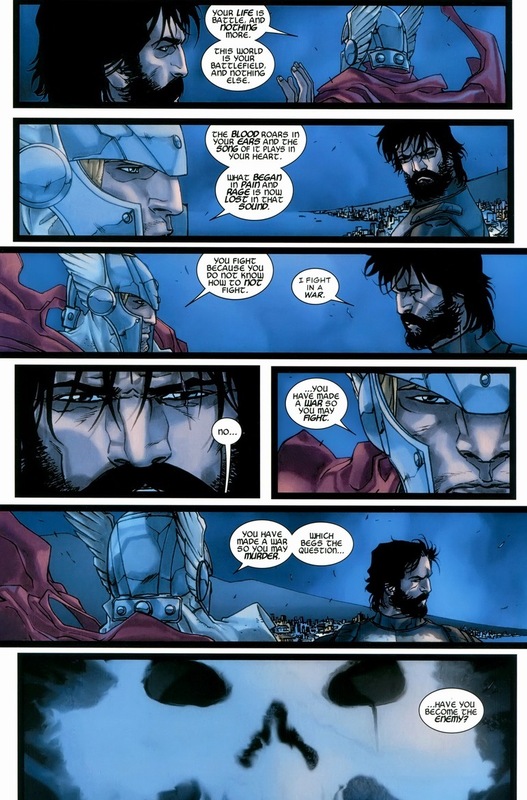 “I fight in a war,” the Punisher states, but how amazingly poignant is Thor’s response to that line? “No, you have made a war so that you may fight.” Just as that exact same reasoning can apply to a multitude of heroes (Batman), we know the end result. The Punisher’s comics must continue and thus any sense Thor makes will be thrown to the wind. And oh my goodness does it. Two issues later and Castle fights Iron Man, Spider-Man, Black Widow, Captain America, and Thor all at once. It’s an eight page battle, which is seven pages longer than Superior Spider-Man lasted when he tried to same thing. 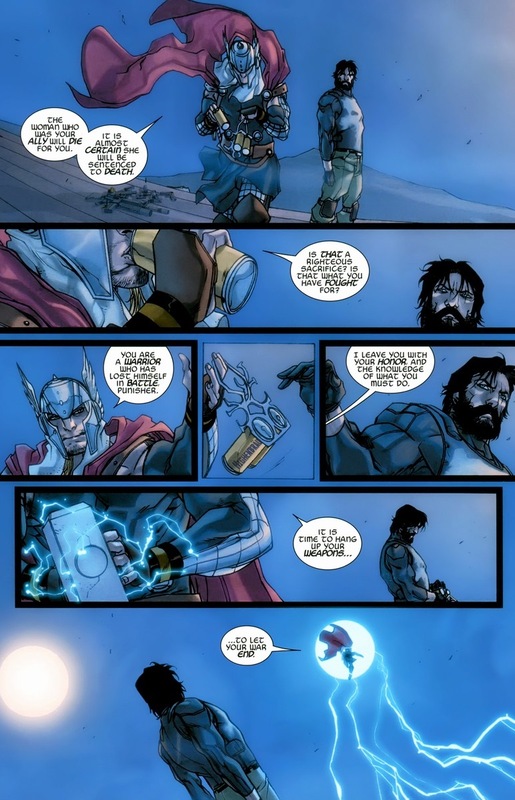 Thor’s plea falls on deaf ears to the Punisher. As Plato puts it, “Only the dead have seen the end of war.” That’s more Punisher’s style. The best summary of the Punisher besides Garth Ennis’ run on Punisher Max. Good work and thanks for showing us this.